Want to know more about the latest innovations for home energy upgrades? Explore these resources to accelerate market adoption of select advanced technologies and help you reach your energy efficiency targets. As you design your program around select technologies, explore the latest research on viability, affordability, installation guidance, marketing strategies, and more. An early step for most energy efficiency planning involves identifying and quantifying energy savings opportunities, followed by understanding how to access this efficiency potential. Explore the energy efficiency potential for your program area and how you can achieve your energy efficiency targets, as you select technology solutions specific to your climate zone, market conditions, and priorities. 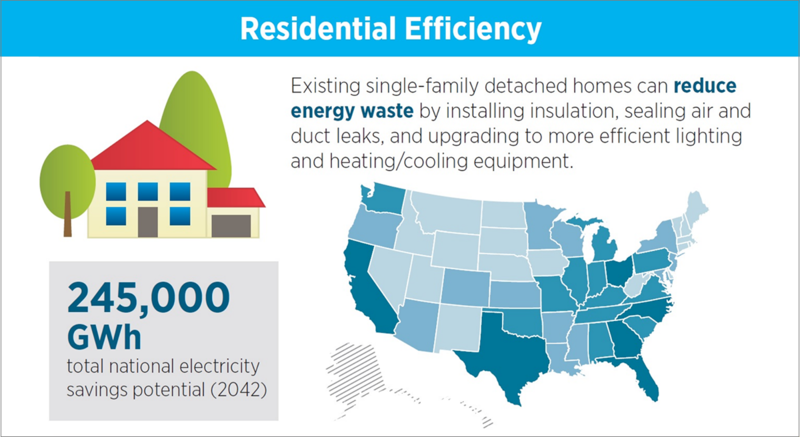 Using the ResStock Analysis Tool, NREL conducted an extensive study of the electric end-use energy efficiency potential in the U.S. single-family detached housing stock, Electric End-Use Energy Efficiency Potential in the U.S. Single-Family Housing Stock. Catalog of State-Level Energy Efficiency Potential Studies is a compilation of state and local energy efficiency potential studies published since 2007. Building on ResStock analysis, State Fact Sheets summarize the cost-effective residential savings potential and top 10 priority improvements in that state.